So my husband loves bean & ham soup. He tells me this turned out delicious. Then he called me awesome. So this one’s a winner. Prep. time: about 20 minutes. Costs less than $10. Feeds 6 – 8. In a large bowl, add beans and enough cold water to cover by at least two inches. Let stand overnight. (And if you forget to do this the night before, you can do the quick method, which is to put the beans in a large pot, cover with hot water by at least two inches, & bring to a rapid boil on the stove. Let it boil for two minutes, then remove from heat, cover & let it sit for an hour). Drain beans & rinse with cold water. Pick out any loose skins you see. In a large skillet, heat the vegetable oil over medium-high heat on the stove. Add the ham, onion, celery, & carrots, stirring often until browned, about five minutes or so. Add the garlic & cook for another minute, stirring often. Add all the ingredients from step 3 into the Crock-Pot, making sure to scrape the browned bits from the bottom of the skillet into the Crock-Pot. Add the chicken broth, water, tomato paste, thyme, salt, pepper, & bacon to the Crock-Pot and stir. Add the beans to the Crock-Pot & stir. Cover and cook for 8 hours on LOW or 5 hours on HIGH. Using a large spoon, crush some beans against the side of the Crock-Pot, enough so that you get the consistency you like, then stir. One Wild Life ~ Learn Photoshop It’s My Second Blogoversary! 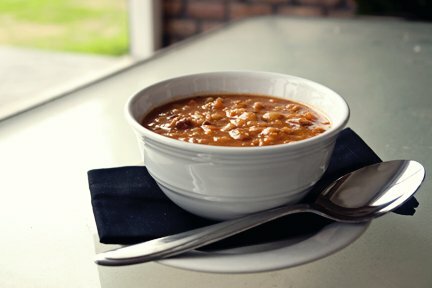 6 Responses to "Hearty Bean & Ham Soup"
I think I agree with your husband: you are awesome! This soup recipe looks delicious, and your photo above is very nice, too. Happy Sunday! Awww, you are fabulous!! It really turned out great & thanks for the compliment about the photo. Here’s something I learned: taking a decent photograph of soup is HARD! 😀 Happy Sunday right back! I forgot to soak them too! Quick method worked great. Let me know if you give it a try. Cheers! The photo makes it look sooo yummy! I’ll have to try the recipe. It really turned out delish. Let me know if you give it a try. Cheers!